In 1154 the Pope gave King Henry II of England permission to invade Ireland and bring the Irish church into line. Henry did not act on this until 1165 when Dermot Mac Murrough, King of Leinster sought his help. Dermot had been expelled from Ireland after he lost out in a typical Irish dynastic struggle. Dermot had lost a war with Rory O'Connor, King of Connaught and High King of Ireland and his ally Tiernan O'Rourke, King of Breffni (modern Cavan and Leitrim). Henry gave Dermot permission to recruit Norman soldiers to help him regain his lands in Ireland. Dermot found the men he wanted on the marches of south Wales, where the Barons were out of favour with Henry. Because they came from Wales, many historians prefer to use the term Cambro-Norman rather than the more common Anglo-Norman, in the interests of accuracy. In May 1169 an advanced party of Normans under the command of Robert FitzStephen landed at Bannow Bay, in Co Wexford. With their help, Dermot quickly regained control of Leinster and captured the Viking town of Wexford. In August 1170, Richard FitzGilbert (know as Strongbow) arrived with a larger force and captured the Viking town of Waterford. Dermot's daughter Aoife married Strongbow. In September the Normans stormed Dublin, they then invaded Meath and attacked Breffni. In May 1171 Dermot died without a male heir, which left Strongbow as ruler of Leinster. After the capture of Dublin, King Henry decided to curb the growing power of Strongbow and minimise the possibility that Strongbow might set-up an independent Kingdom in Ireland. In October 1171 he landed at Waterford. In return for his submission Strongbow was granted Leinster. To act as a counterbalance Henry granted other parcels of land to the remainder of Strongbow's knights. Meath went to Hugh de Lacy and, in Munster, Milo de Cogan assumed lands to the west of Cork harbour while Fitzstephen was granted lands to the east of Cork. At the Council of Oxford in 1177, Henry II granted the kingdom of Cork to Robert FitzStephen and Milo de Cogan. Carrigaline Castle, Ireland, was built by the Norman family of de Cogan that came to Ireland during the Norman Invasion, the founder Milo de Cogan being one of King Henry 11’s top Knights along with Robert Fitzstephen. The castle was probably started by Milo around 1180 but not completed until the 1190’s. Milo de Cogan (died circa 1183) was Strongbow's right-hand man in the Cambro-Norman invasion. He was granted a huge area in Co. Cork by Henry II and the great territorial family was thus founded. Though reinforced by grants to Richard de Cogan in 1207 and still of sufficient importance to be listed among the chief gentry of the barony of Kinelea in 1591, as a family of power it was practically extinct as such by the end of the seventeenth century. Minor branches of it, however, survive up to the present day, usually under the name of Goggin and sometimes Gogan. The original form of the name, de Cogan, derives from Cogan, a parish in Cardiff. Patrick de Courcy, the second Baron of Kinsale, married the daughter of Miles De Cogan. Miles De Cogan ("the noblest baron in his time in Ireland" according to the Annals of the Four Masters) was killed in the battle of Athleathan, in 1316, in which Slemme De Exeter, lord of Athleathan who was in command of the English forces, was also slain. John de Courcy who succeeded as the 18th Baron of Kinsale on the decease of his cousin, Gerald, the 17th Baron, married, first, Catherine, daughter of William Cogan, M.P. for Cork County in 1585; and, secondly, Mary, daughter of Cornelius O'Cruly (or O'Crowley). The Barretts, Barrys, Roches and Fitzgeraids came to incur upon the holdings of the de Cogan family in Cork, as their fortunes declined. 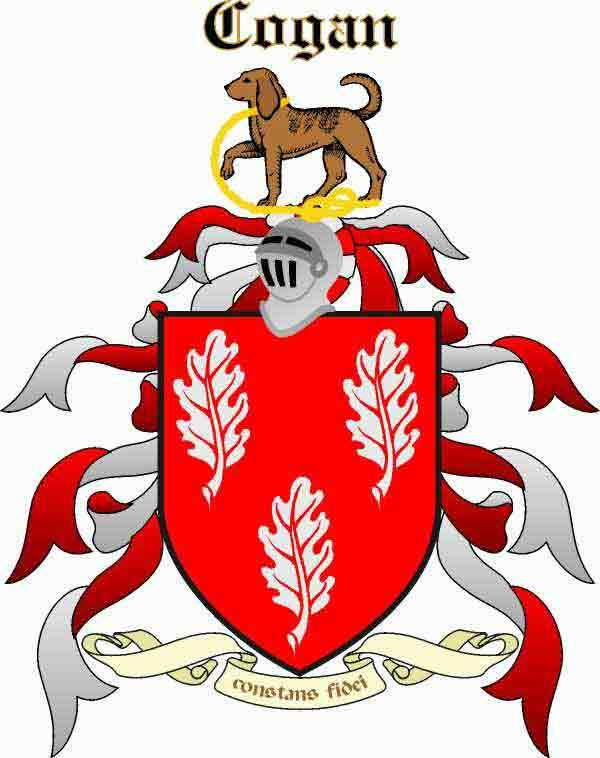 In 1405 it is given that the family was centred at Kerrycurrihy in Cork, and the name remained plentiful here into the 17th century as evidenced by the census of 1659. Records indicate that the family was centred at Barnahely Castle and Goolmore Castle even after the decline of the family in the 15th century. They are additionally tied to the castles of Aglish, Macroom, Crosshaven, Cullen, Ballyhea, Kilbolane and Rathgogan, among others. THE CHARTER OF OXFORD. "HENRY, BY THE GRACE OF GOD, KING OF ENGLAND, AND DUKE OF NORMANDY AND AQUATAIN EARL OF ANJOU. To all Archbishops, Abbots, Earls, Barons, Justices, and all Ministers, and faithful Subjects, French, English and Irish, greetings. “Know ye, that I have granted, and by this my charter, confirmed to Robert FitzSlephen and Milo deCogan, the government of the City of Cork, with the cantred which belonged to the Ostmen of the said City, which I retain in my own hands, to have and to hold them together, during my pleasure, and as long as they serve me faithfully. I, moreover, by this charter, give, grant, and confirm to them and their heirs, all the Kingdom of Cork, except the said City, and the afore mentioned cantred, which I retain in my own hands, to hold to them and their heirs, of me and my son John, and our heirs, by exact division, towards the Cape of Saint Brandon, on the sea coast, and towards Limerick and other parts, and as far as the water near Lismore, which runs between Lismore and Cork, and falls into the sea; by the service of sixty knights, to be performed there, to me and my son John, and our heirs, and the service of thirty knights to be performed by the said Robert, and his heirs and the service of thirty knights, by the said Milo and his heirs. Wherefore, I will, and strictly command, that the said Robert and Milo, shall have and hold the said government of the said city and cantred, in manner as it is before mentioned, and that they and their heirs, shall have and hold all the kingdom aforesaid, except the said city and cantred, which I retain in my own hands, for me and my son John, and our heirs, by an exact division, as described above, well and peaceably, freely and quietly, entirely, fully, and honourably, in wood and in plain, in meadow and pasture, in waters and mills, in warrens, ponds and fishing, in ways and paths, and in all other places and things belonging there, with all their liberties and free customs, so that from the aforesaid river that runs between Lismore and Cork, the whole land as far as Waterford, together with the city of Lismore, shall remain in my hands, for the government of Waterford." Witnesses present: John, Bishop of Norwich; Adam, Bishop of St. Asaph, and Augustine Bishop of Waterford; Richard deLacey; William Fitz-Adelm; my Sewer; Hugh deLacey; Hugh deBurid; Roger Fitz-Ramsey; Maurice dePendergast; Robert Dene; Robert Fitz-Eliodore; leffrey Poer; and Harvey deMonte Marisco. At Oxford." Arms: Gules three oak leaves Argent. Crest: A talbot passant proper collared and lined Or. Motto: constans fidei.